You can’t access this shared folder because your organization’s security policies block unauthenticated guest access – It`s simple when you know how ! ” You can’t access this shared folder because your organization’s security policies block unauthenticated guest access. These polices help to protect you PC from unsafe or malicious devices on the network”. 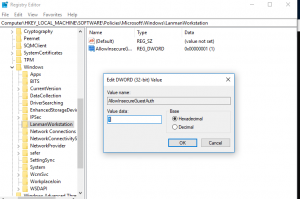 Next: hyper-v 2016 management tools could not access an expected wmi class on computer ….